Home > General Inky Interest, Penbox Pen News, Sheaffer	> Silver Sheaffer Legacy or Designer Hair Slide? Silver Sheaffer Legacy or Designer Hair Slide? A silver Sheaffer Centennial Legacy or a designer hair slide? Make a statement this Christmas at the office party with the all sterling silver Sheaffer Legacy Centennial designer hair slide. 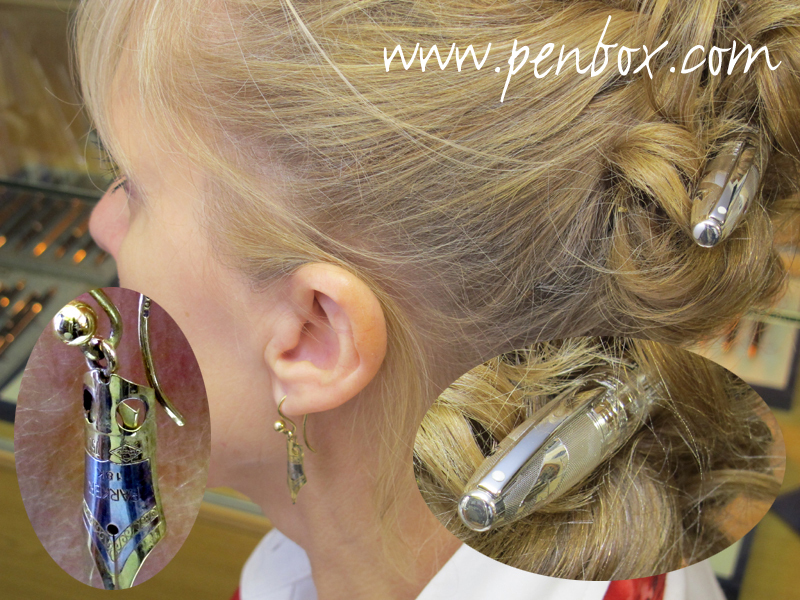 When my partner asked for an all silver pen I didn’t know that she intended using it as a designer hair slide, and as an accessory to her figural nib earrings. Luckily, for the ladies out there who want a designer silver hair slide, we have them on offer at less than half price here.